____Encourage you to choose the best product for your needs. Netbook Toshiba NB205 mini features an elegant design blend between the color of bronze and silver finishes at the back make this one seem netbook professional. Toshiba netbook member price is worth $ 399. Meanwhile, for the dimension of the mini NB205 netbook Toshiba is approximately 10.4 x 6.7 x 3.1 inches, quite compact with a six-cell battery in this netbook weighs 2.8 pounds. 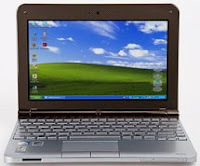 Netbook Toshiba NB205 mini is equipped with Intel Atom processor, 1GB of RAM, and Microsoft Windows XP Home system, with keyboard and touchpad are captivating, plus the battery life up to 8.5 hours. Genuine Windows XP Home CPU : 1.66-GHz Intel Atom N280 RAM : 1GB, Harddisk : SATA 160GB, speed 5,400rpm Display : 10.1 inch resolusi 1024x600 px. Graphics Card : Intel GMA 950. Video Memory : 251MB. Wi-Fi : 802.11b/g. Bluetooth : Bluetooth 2.1 EDR. Ethernet, Headphone, Kensington Lock, Microphone, VGA, 3 port USB. Card reader . * The USB port can be to charge the battery when the system Off. 1 Response to "Netbook Toshiba Mini NB205"